Don’t you love when your family asks what you’re making for dinner and you tell them ‘vegetarian’ and they give you grief? Ya, me neither. …But then I get to sit and gloat during dinner when they are loving it. This was one of those meals. So, in all honest, I was shocked by my first bite of these vegetarian tacos. I think it’s the combo of the tangy feta with the sweet zucchini and corn. It’s really incredible. The leftovers were great too, and this made for a couple mighty tasty lunches for me at work as a bonus. By the way, if you are wondering why I used feta instead of queso fresco, the feta was two dollars cheaper. I am now a convert for feta on tacos. What you also see in the background there is a heaping of my Mexican Yellow Rice. You can get that recipe here. Heat the olive oil in a large nonstick skillet on high heat. 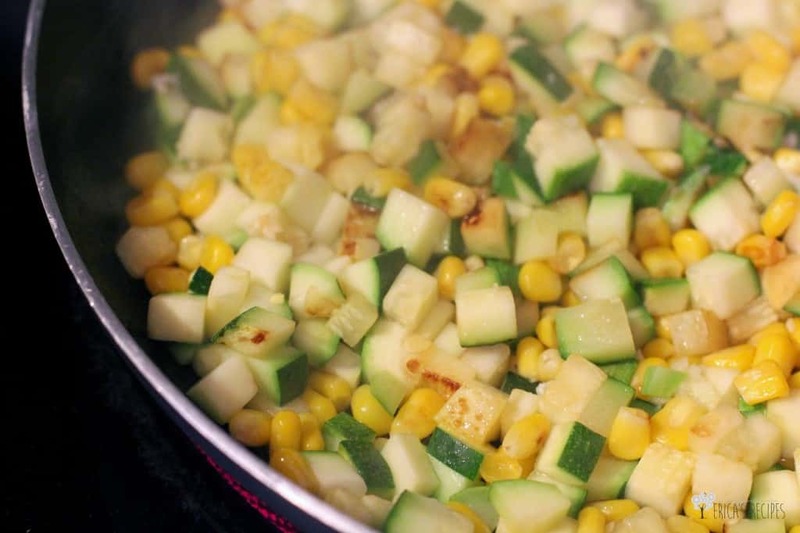 Add the zucchini, corn, and garlic, and saute, tossing occasionally, until zucchini is softened and lightly browned. Add the black beans, chiles, taco seasoning, and salt. Taste for seasoning and add additional salt if necessary. Heat a small, nonstick skillet on high heat. Spray with cooking spray and add a tortilla. Spray the top side of the tortilla with cooking spray. Lightly toast the tortilla, turning once, and set aside. Repeat with the remaining tortillas (this will keep them from falling apart when eating). 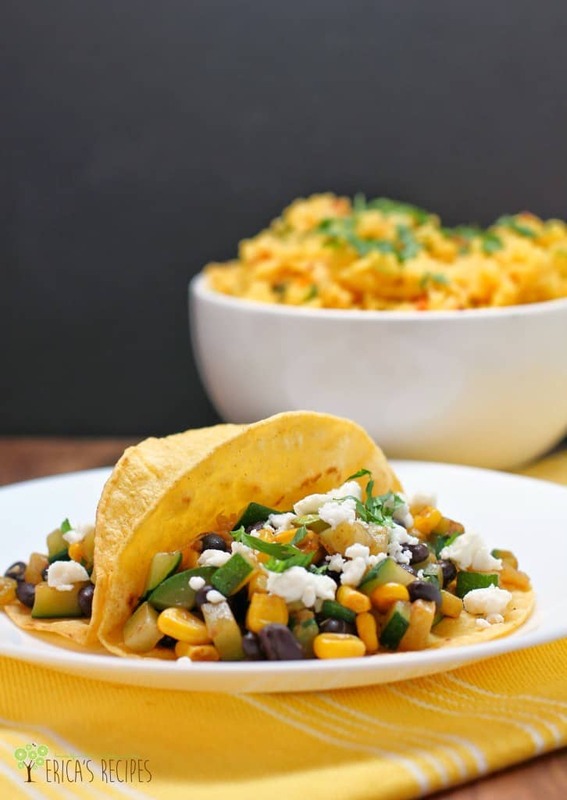 Serve the zucchini taco filling in a tortilla, topped with feta and fresh cilantro. Yield: 4 servings. I cannot wait to try these tacos! I’ve been looking to switch up a regular choice of fish tacos, and this seems like a great alternative. I get the same reaction from my husband when I tell him we’re having a meatless meal. But these look absolutely delicious! 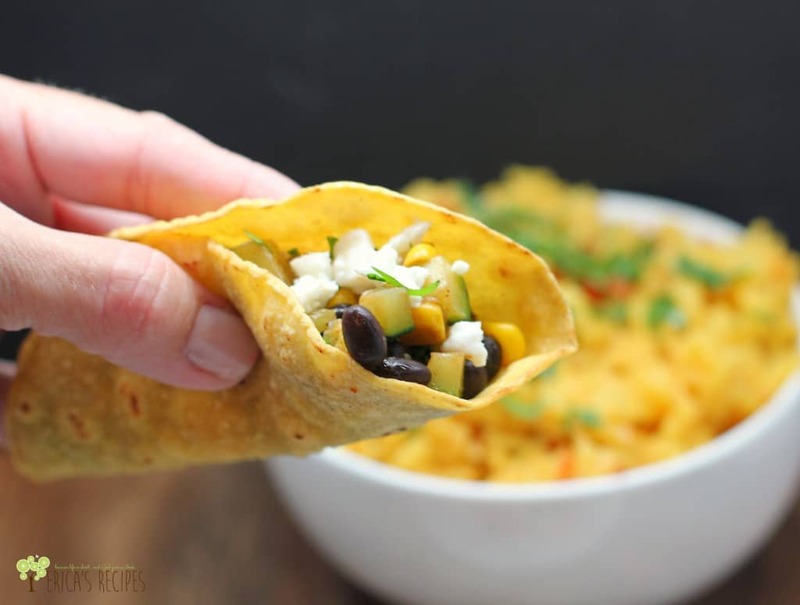 These look amazing Erica, I LOVE both corn and black beans 🙂 stumbled and pinned, thanks for sharing over at the new FB group!! These look really good! Your pictures are beautiful. I usually just make regular tacos, but I should mix it up and try some variations like this. These look so good! 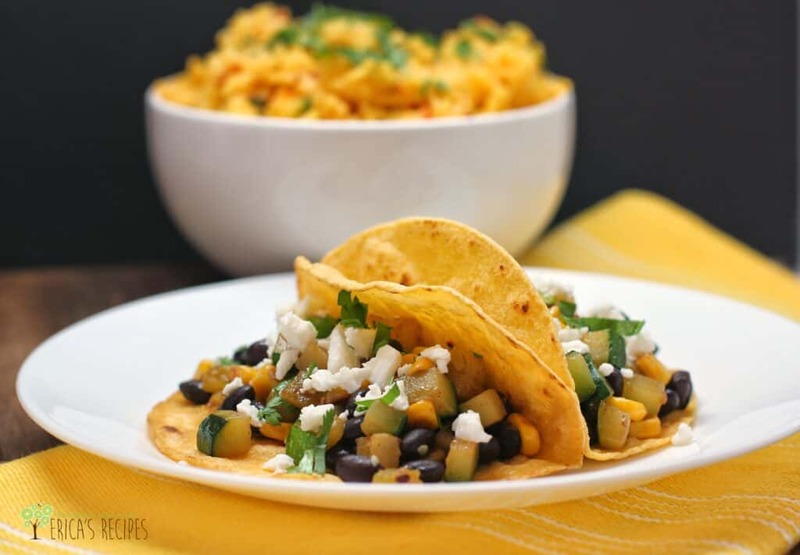 We love corn and black beans…excited to try this! This is definitely a new and different way to use my zucchini this summer! Thanks for sharing. This is my kind of dinner! I love it! So summery and Mexican food is my favorite! Beautiful pictures too. Yum! pinning and stumbling. Have a great day! Lovely! One of my twins is a vegetarian and I’m having a hard time finding foods he likes. I can’t wait to try this one, he is giving me a thumbs up! I just love the great combination of flavors, textures and colors in this dish! I am always on the lookout for healthy vegetarian meals and know I will be trying your recipe soon! I just love this recipe! It’s a great way to have veggies with no argument! This is definitely a filling meal and everyone loves tacos! 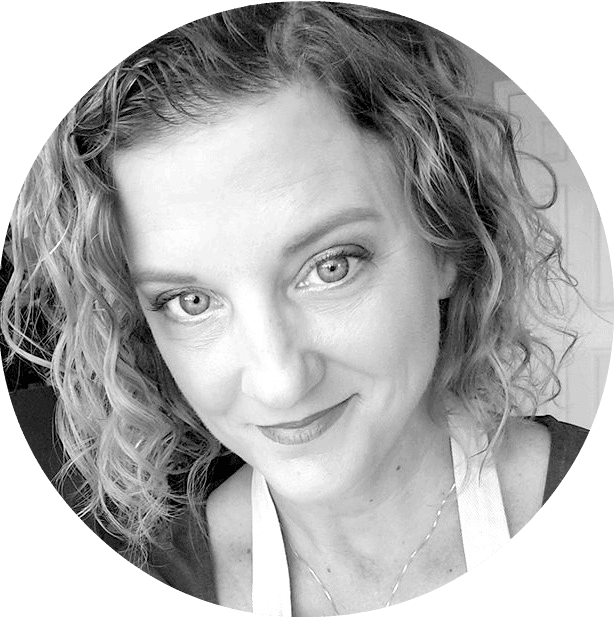 Love this recipe, Erica! This is such a perfect taco and my family would love this. These look delicious! I love tacos cause they are so tasty, yet so quick and easy to make. These seem very easy, and great for those weeknights when pressed for time. Pinning. I will definetly try these. Found on Food Friday. These look so good. I am always looking for meatless-Monday options. I will definitely be trying this. Pinned. Now following. My husband and daughter want more vegetarian meals, but not my son. Impossible to make everyone happy. Love this recipe, pinned. Thanks for sharing it on foodie friday. These sound delicious. I love corn and black beans together. Thanks for sharing on Foodie Friends Friday! These look amazing, no wonder you got to gloat when they where gobbling them up. Nice recipe, Erica! I will do the same thing about a vegetarian recipe and then be pleasantly surprised when the general consensus is that the dish is awesome. And this certainly SOUNDS awesome, so I cannot wait to try it at my house! Also, this was one of my favorites from last week’s That’s Fresh Friday link-up! I’ll be sharing it at my blog tonight and this weekend as we kick off another party. Thanks for participating, and keep up the great work! Hi! I linked to this recipe in my June Real Food Monthly Meal Plan article. I can’t wait for the summer veg to show up at the farmer’s market. Thanks for posting! cure the autistic people in more ways than one. fast a page on your site is loading and give you tips on how to improve it. I’d love to include a photo & link to this recipe in an article of healthy taco recipes I’m writing for Life by Daily Burn (www.dailyburn.com/life). Both will be credited to you & will link back for the recipe. Would this usage be OK?